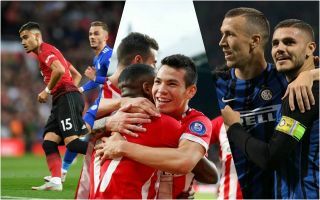 With just a few days left of the January transfer window, we’ve taken a look at the Ivan Perisic to Arsenal rumour and other big stories that could be worth keeping an eye on before Thursday night. The transfer window officially slams shut at 11pm on Thursday the 31st of January, and many top Premier League clubs will hope to have done some business by then. One of the main stories doing the rounds at the moment is the Ivan Perisic to Arsenal one, with Gianluca Di Marzio among the sources talking this potential deal up. There do seem potential complications in the transfer, however, so it remains to be seen if the Gunners can agree a deal for the Croatian quickly enough to get him in by the end of the week. Perisic is a top talent, however, and it would be exciting to see him try his luck in the Premier League after some impressive displays in Serie A down the years. Ivan Perisic to Arsenal before the transfer deadline? Arsenal are described as ‘hopeful’ of getting Christopher Nkunku in from Paris Saint-Germain, say football.london, though it also hinges on the Ligue 1 giants making a signing. This versatile youngster can fill a number of roles and seems a sensible addition for Unai Emery’s side right now, even if he’s not exactly the biggest name. Still, with so many other players being linked with Arsenal right now, it remains to be seen if he’s a top priority, or if another target joining would mean his move was cancelled. One of the more exciting Arsenal rumours doing the rounds is the one involving Barcelona outcast Malcom. The Brazilian starlet looked a huge talent with Bordeaux last season, and has been pretty unlucky to be overlooked at Barcelona. The Sun claim Arsenal are now trying to snap him up, though Don Balon also claim he’s held talks with Tottenham. The Sun also claim Arsenal are still in talks over a move for another Barca player, Denis Suarez. The 25-year-old is yet another player not getting much playing time at the Nou Camp, and he seems like he has the ability to add something to this squad at the Emirates Stadium. Could there still be time for Arsenal to launch a double raid on the Catalan giants? With Cesc Fabregas leaving for Monaco and Mateo Kovacic only at Chelsea on loan, a move for Nicolo Barella makes perfect sense for the Blues. The £50million-rated youngster been linked with Chelsea by the Daily Mirror, though they suggest a summer deal is more likely. Still, this is one to surely keep an eye on in the final days of the transfer window after plenty of intent shown so far by CFC with their move for Gonzalo Higuain.